Kodi's Mom is a good friend of Saffron Tree. This is her first guest review for Saffron Tree. 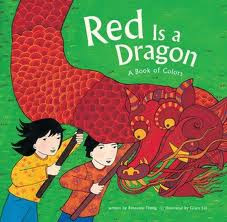 It is about a wonderfully refresing, Chinese-themed picture book titled "Red is a Dragon". I thank K's Mom for this engaging and insightful review. Don't miss her new rating system at the end of the review! 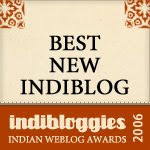 We've tried to make it a little Desi/Indian style rating! We welcome feedback/suggestions. Enjoy, Red is a Dragon! Introducing the concept of colors to a toddler is a very tricky venture. A color is not an object you can name, color does not have shape you can trace, color is not finite to count. Color is, at best, an abstract concept. perplexed mom. So, when it came to teaching my 18mo colors, I sought guidance from the best of teachers - books. illustrated by Grace Lin. I found this book to be exceptional for three reasons. 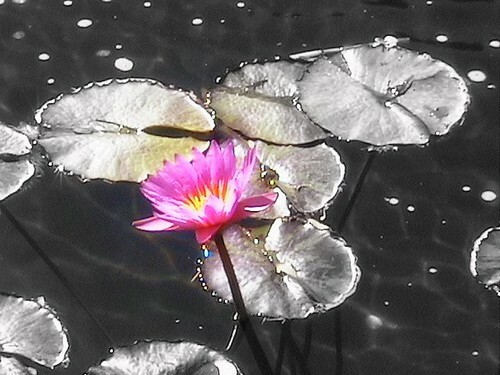 One, because of how it emphasises colors as opposed to the objects that are of that color. See the difference between: that ball is red versus red is a ball. Red is no longer a descriptor, but a subject. Red is what happens to the ball. The ball can be replaced with anything red. By rephrasing this way, the author shows how red can be so different many things, and it is still red. A dragon! And firecrackers! Not apples and strawberries - but mythical dragons and noisy firecrackers. That is the second thing about the book that bowled me over. With just those four lines, the book promised to break convention and paint colors from another world. The illustration on the first page is one of a Chinese New Year parade...where kids are playing the aforementioned red drums and bursting firecrackers, and others are carrying the effigy of a snaky dragon, as a family looks on. [enter picture of page 1 here] The colors are not jarring red with bright contrast but soft, almost washed over shades of red. Which is the third thing that endeared the book to me. The illustrator teams up perfectly with the author and brings alive a vibrant dragon. The people portrayed in the book are of Oriental origin, and they wear elegant, traditional Oriental clothes, their house is decorated with Chinese artifacts, they eat Chinese food with chopsticks. Chinese New Year parades, and several families that have migrated over from the Far East carrying with them the material representations of their culture - their clothes, art, cuisine. After all, there are a lot of Indian families in the west, in which the women wear sarees and light agarbathis, so perhaps the same is true of the family portrayed in this book. The situational city is irrelevant, the author and artist offer us a peek into the colorful lives of a Chinese family. All the while, subtly showing toddlers a whole rainbow of colors. mesmerizing in far away lands for the little-at-heart ones. Author, Rosseane Thong's website: http://www.greenfield-thong.com. Do check out her other books - Round is a Mooncake to introduce shapes, and One is a Drummer to offer some fresh counting fun to your kids! Wow. Fabulous review Praba. Lovely lovely Kodi's Mom. I am so impressed with the concept of the book. Shud get this when its time for Sathya to learn colours. Btw...the rating concept deserves 5 bindis all by itself. Three cheers for Red is a dragon, and for Kodi's Mom for this wonderful find! This is an awesome list that helped when i was looking for books for my kids. Precious!! thanks for the links! I will take a look..
Tharini - thanks...will be wonderful to hear how Sathya enjoys it. Praba - 'bindis' is way cooler than stars - good thinking :) Thanks for being patient while I drummed this up. I have a simple book in mind for the next one - will get that in soon..